The Aga Khan I had to face periodical troubles from certain dissident members of his community. In 1243/1827, while the Aga Khan was in Iran, a group led by Habib Ibrahim in Bombay refused to pay tithe and forced others to do so. The leaders of the Bombay jamat made a report to the Aga Khan in Iran about it at the end of 1244/1828. The Aga Khan, in order to overcome this opposition, sent to Bombay as his agent, Mirza Abul Kassim, who was accompanied by the Aga Khan's mother, Bibi Sarcar Mata Salamat (1744-1832) in 1245/1829. 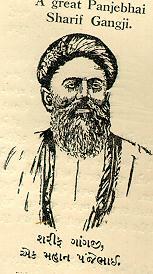 It was in the course of these proceedings that Mirza Abul Kassim filed a suit on behalf of the Aga Khan against the dissidents in Bombay High Court. The suit, however, was not processed and withdrawn on July 22, 1830. The recusants were summoned in the jamatkhana, which proved no responsive, and as such, Habib Ibrahim and eleven other persons had been outcast from the community in 1246/1830, who were then known as Bar Bhai (twelve brethren). After five years, in 1251/1835, they were re-admitted conditionally, who had however laid a root of a dissident group. The Aga Khan arrived in Bombay on December 16, 1845. He had to leave Bombay for Calcutta, and returned to Bombay on December 26, 1848. Consequently, the Aga Khan's absence for 18 months emboldened the dissident gang to engineer propaganda against him. When the Aga Khan was yet in Calcutta, a fresh litigatiion, known as Sajan Mehr Ali Case was carried in 1263/1847, in which the question of the rights of female inheritance among the Ismailis was brought before the Supreme Court of Bombay. Sir Erskine Perry (1821-1893), the Chief Justice presided over the Khoja Inheritance Case of a certain Hirbai and Sonabai. In this case, the Aga Khan was represented by his brother, Muhammad Bakir Khan (d. 1296/1879), who endeavoured to uphold the rule of inheritance according to the Holy Koran. The dissident group, Bar Bhai was active in supporting the argument of the defendant. This case led to fresh feuds among the community. The Bar Bhai group began to broadcast aggressive propaganda against the Aga Khan, and in view of their unwillingness to acknowledge the Aga Khan's spiritual authority, they had been ex-communicated in 1264/1848. Henceforward, the basic issue of the tithe originated in 1243/1827 became submerged by the petty quibbles. The other issues challenged the Aga Khan's authority, and claimed themselves as the Sunni Khojas, stressing that the Ismaili Khojas had been Sunnis since their conversion to Islam by Pir Sadruddin. They also built their own separate prayer-hall and grave-yard in 1266/1850. On November 13, 1850, a tragic event arose between the Ismailis and the Sunni Khojas in the prayer-hall in Bombay. On the last day of the commemoration of Muharram, four Sunni Khojas were killed, 19 of the Ismailis were tried in the criminal court and four were hanged on December 18, 1850. On October 20, 1861, when the dissenting Khojas publicly joined the Sunni fold, the Aga Khan issued a decree in which he expressed his desire to bring the Ismailis to conform to the practices of the Shia Imami Ismaili creed of his holy ancestors, regarding marriage ceremonies, ablutions, funeral rites etc. The decree ended thus, "He who may be willing to obey my orders shall write his name in this book that I may know him." Copies of the decree were kept at the house of the Aga Khan's son in Bombay for signatures and were circulated in Sind, Kathiawar, Kutchh and Zanzibar. Except for a handful persons in Bombay and Kathiawar, an almost unanimous acceptance was received from the Ismailis. The loyalty of the Ismailis for their Imam can be gauged from the reaction of the Bhuj jamat at Kutchh, who sent a letter dated January 2, 1862 in reply to the communication sent by the plaintiffs as illustrated by E.I. Howard to the Hon'ble Court. It reads: "We are upon the right side, but should His Lordship Aga Khan ask for the signatures, we are ready to give thousand times a day. Whatever order comes from him, we are bound to obey." Observing the above letter, Justice Sir Joseph Arnold (1814-1886) remarked: "This is a very decided letter; at any rate, there can be no mistake about that." (cf. "The Shia School of Islam and its Branches", Bombay, 1906, p. 93). In the meantime, Mukhi Alarakhia Sumar and Kamadia Khaki Padamsi (d.1877) called a meeting in Bombay Jamatkhana on August 16, 1862. Habib Ibrahim and his son Ahmad Ibrahim and few others were also summoned, but none of them attended the meeting. Thus, a notice of 21 days was served to them, effective from August 23, 1862 but of no avail. At length, they all had been expelled from the Khoja Ismaili community for ever. The seceders formed a group, called The Reformers' Society, who refused to acknowledge the Aga Khan as their religious head and tried to withhold from his properties dedicated to him by his followers, and finally filed a suit in April, 1866 against the Aga Khan in the Bombay High Court. This case, generally known as The Aga Khan Case or The Khoja Case was heard by Sir Joseph Arnold (1814-1886). The Plaintiff of the case were Daya Mahomad, Mahomad Saya, Peer Mahomad Kassim and Fazal Ghulam Hussain with H.M's Advocate General as nominal complainant. The Defendants were the Aga Khan I, Mukhi Alarakhia Sumar, Kamadia Khaki Padamsi, Mahomad Peer Bhai, Nur Mahomad Rajpal, Ali Bhai Jan, Habib Ibrahim, Muraj Premji, Dharamsi Punja, Aasu Gangji, Dossa Ladak, Nanji Alloo and Mahomad Yousuf Murgay, Qadi of the Mahomadans of the Town and island of Bombay. The court's proceedings lasted for 25 days after which the Judge settled down to examine and study the mountain of evidences and seek enlightenment in history. Sir Joseph Arnold had indeed a hard task sifting the evidence, separating facts from a lot of legal chaff. On November 21, 1866, Justice Arnold rendered a detailed verdict against the plaintiffs. The result was a lengthy and well argued judgment which decided, once for all, that the Khoja community "is a sect of people whose ancestors were Hindu in original, which was converted to, and has throughout abided in, the faith of the Shia Imami Ismailis, which has always been and still is bound by ties of spiritual allegiance to the hereditary Imams of Ismailis." This judgement unequivocally confirmed the Aga Khan as the spiritual head of the Khoja Ismaili community and legally established the Islamic root and identity of the Shia Ismaili Muslims. During the Aga Khan case at Bombay, some eminent Ismailis had rendered valuable services to the community in all affairs, the most prominent among them were Ismail Kherraj, Sharif Gangji, Mukhi Alarakhia Sumar, Kamadia Khaki Padamsi etc. The Aga Khan I recognised them as Ismaili fidais and Ismaili soldiers. They were known as the Panje Bhai (one who shakes hand) to distinguish them from the Bar Bhai (twelve brethren) and originated the tradition of Panje Bhai Club in the community. The Aga Khan I seems to have left behind his memoirs in Persian, entitled "Ibrat-i Afza", relating to the events of the youth and his encounters with the Qajarid regime in Iran, also covering his migration to Afghanistan and then to India down to the period of 12th Safar, 1262/January 29, 1846. According to W.Ivanow (1886-1970), it was actually written on behalf of the Aga Khan I by Mirza Ahmad Wiqar Shirazi (1820-1881), the son of the famous poet Visal (d. 1262/1846), who stayed briefly with the Aga Khan in Bombay in 1266/1850. It was lithographed in Bombay in 1278/1862, and reprinted with the numerous typographical errors by Bawa Nazar Ali Karimdad, who got its translation into Urdu, and made its Gujrati translation in 1281/1865. The unedited Persian text was published by Hussain Kuhi Kirmani at Tehran on 1325/1946, and was also published in "Aga Khan Mahallati wa firqa'i Ismailia"by M. Sa'i in Tehran in 1329/1950. Hence, the originality of the book seems to have been completely lost due to the alterations made by the partisans of Nimatullahi order, and the accessible printed copies attributed of being a genuine work of the Aga Khan I is the remotest. The fact that the Aga Khan I had a large following outside India was brought to light by Sir Thomas Douglas Forsyth (1827-1886) in "Report on a Mission to Yarkand, Calcutta, 1875", who in the time of Lord Richard Southwell Bourke Mayo (1822-1872), had led a deputation from Lahore to Yarkand in 1869, and he was also sent to the mission of Kashgar in 1873. The members of Sir Douglas Forsyth's mission ascertained that these Ismailis formed the whole of the sparse population in many of the valleys leading down from the Pamir, the elevated "roof of the world", on the banks of the higher Oxus, and its affuents - in Chitral, Gilgit, and in remote valleys between Kafristan and Badakhshan. The Aga Khan I spent his final years peacefully in Bombay, with seasonal stay in Poona, and sometime in Banglore. While on visits to Banglore, he had formed a friendship with the then ruler of Travancore, and subsequently represented that important state in Bombay. He used to visit the Indian communities all over India. He invariably attended the Jamatkhana every morning at Bombay and lectured on the moral and religious precepts they should follow. He used to recite some passages of the Holy Koran in Arabic and then explain them in Persian. Next to him would stand a man who understood Persian but also knew Sindhi, who would translate the Imam's words into Sindhi. With a taste for oriental splendour, he established an imposing residence on Malabar Hill overlooking the sea and installed his family in equally sumptuous houses around him. The affairs of the community were conducted from Aga Hall, a magnificent palace with separate library and staff quarters, set in fine parkland and enclosed by a high wall. Apart from his three wives, four sons and six daughters, the Aga Khan I also looked after a thousand or more relatives and retainers who had come with him from Iran. His elder son was Aqa Ali Shah, who succeeded him. The second son was Aga Jhangi Shah (d. 1314/1896), whose sons were Zayn al-Abidin Shah, Shamsuddin Shah and Shah Abbas; and Haji Bibi and Shahzadi Begum were his daughters. The third son of the Aga Khan I was Aga Jalal Shah (d. 1288/1871), who had two sons, viz. Muchul Shah and Kuchuk Shah, and two daughters, Shah Bibi and Malek Taj Begum. Akbar Shah (d. 1322/1905) was the fourth son, whose two sons were Shah Rukh Shah and Furukh Shah. The Aga Khan I died in the night of April 12, 1881. He was buried at Hasanabad on Mount Road, Mazagon, on the site of the Eden Hall, where a splendid mausoleum was built at the cost of rupees three lacs. His funeral was attended by thousands of the Indians and Europeans, and all the communities, including the Consuls for Iran and Turkey and high officials of the government. The Aga Khan I was succeeded by his son, Aqa Ali Shah, the Aga Khan II. His wife Sarv-i Jahan Begum, the daughter of Shah Fateh Ali also died in the following year at Bombay.